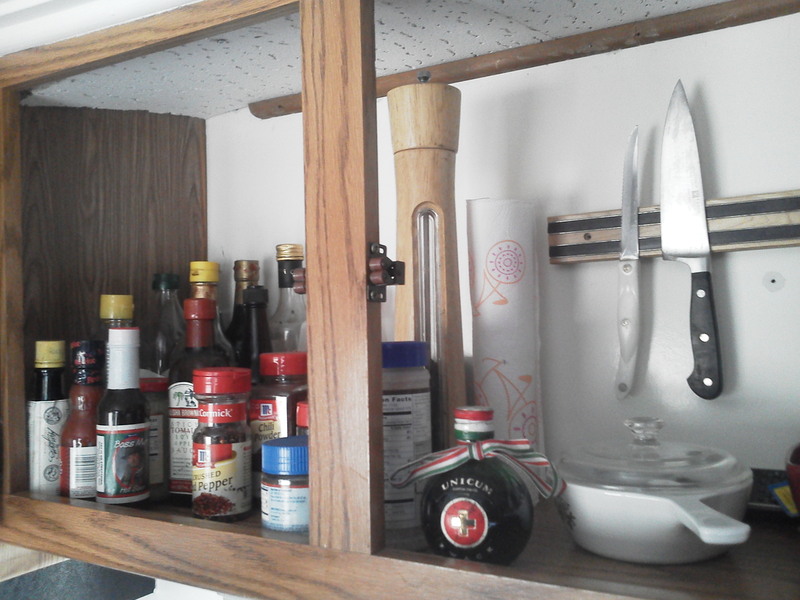 The Pretentious Pepper Grinder fits in my cabinets! This may not seem like much to you, but the PPG was a gift to me many years ago, and it’s followed me through quite a number of kitchens. And now that I’m in a confined living space, I was becoming nervous that I was going to have to put it someplace inconvenient. This whole thing is an exercise in organization. Complicated organization. I’m going to have to become quite a bit neater. This is not a bad thing, of course. I’m a bit more than a week into living in a camper, and it is strangely liberating. I find myself looking at duplicate items – for instance, I brought a double-arm corkscrew AND a corkscrew/bottle opener thing – and thinking how silly it is to have redundancy. Goodwill shall be getting a box. Everything becomes a necessity, but the definition of necessity is a bit changed. Multiple backup light sources ARE a necessity when power isn’t a certainty, but multiple ways to open a bottle of wine are not. It’s fun finding out how little stuff one actually needs. Now, I’m still not fully in the camper – I don’t have water, propane, or full electricity. With nothing but an extension cord, I have a laptop and means to charge various electronics. It’s a workspace and a sleep space for now, but it will be livable soon. I apologize for the brief and autobiographical nature of this post – I haven’t been doing much beyond simple existence-type things for the past week or so, so that’s really all I have to write about. This will change.